Baking and Mistaking: Be My Friend? It's been a long time since I've asked anyone this...but will you be my friend? 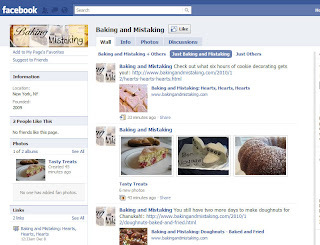 That's right...Baking and Mistaking now has it's own fan page on Facebook! Haven't you always wanted to recommend me to all your friends. Of course! Now's your chance! Click here or check out the widget in the sidebar to "like" the fan page. Thanks! Thanks for your support Linda!